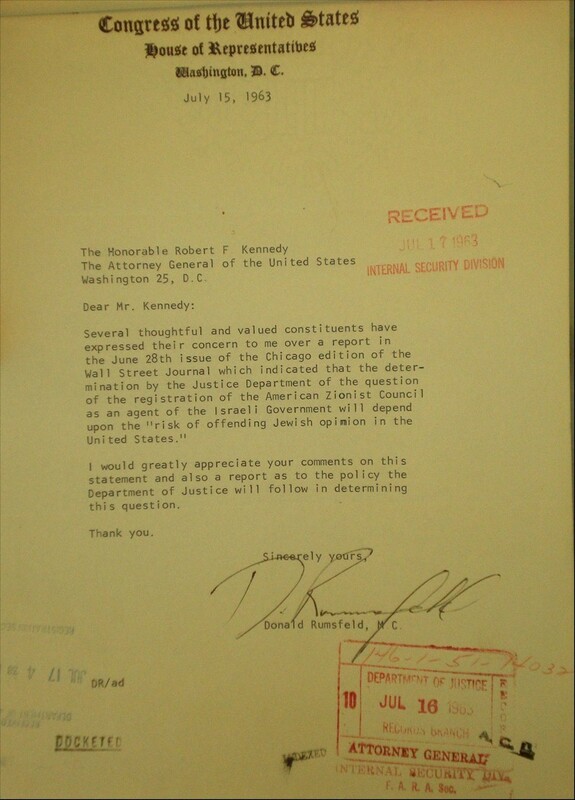 After uncovering and documenting some of the AZC’s most egregious activities, Attorney General Robert F. Kennedy ordered AIPAC’s parent organization — the AZC — to begin openly registering as an Israeli foreign agent on November 21, 1962. Resistant to transparency and accountability, the AZC asked the Justice Department to keep its filed activities as a foreign agent secret, a subversion of the 1938 Foreign Agents Registration Act transparency provisions. The DOJ complied and refused to publicly release files about the AZC’s foreign agent filing until 2008. This secret pact allowed the AZC to quietly shut down and transfer all key activities into its formerly unincorporated lobbying division, the American Israel Public Affairs Committee. AIPAC incorporated just six weeks after the AZC FARA order, but has never registered as a foreign agent. According to newly declassified documents, the Senate Foreign Relations Committee notified[pdf] the Internal Revenue Service of its findings about how tax-exempt funds were laundered from Israel into nonexempt activities of the AZC and its AIPAC lobbying division. But after a cursory investigation, and in spite of the DOJ foreign agent order, the IRS refused to revoke the AZC’s tax-exempt status[pdf]. In 1967, after landslide fundraising in the wake of the Six-Day War, AIPAC submitted its own application for IRS tax exemption editing out mandatory information[pdf] about the critical early support it received from the AZC and Israel. The IRS granted AIPAC a tax exemption in 1967 — retroactive to 1953 — boosting the impact of the Justice Department’s prior cover-up of the organization’s true history. Rosen’s 2010 defamation lawsuit court documents (PDF) reveal that AIPAC’s classified information trafficking has been much more widespread than previously known. AIPAC obtained a "secret National Security Decision Directive #99 calling on the Armed Services and Secretary of Defense to explore the potential for stepped-up strategic cooperation." AIPAC gleaned classified annual reports of secret U.S. arms transfers. AIPAC skimmed classified law enforcement files about North African financial transfers to African-American political activists, which it then used to sabotage Jesse Jackson’s presidential campaign. AIPAC suctioned up classified U.S. intelligence about Khartoum. An AIPAC board member funneled classified raw U.S. signals intelligence into a lobbying effort, while another AIPAC employee solicited and received classified information about secret U.S. understandings with Saudi Arabia. Such pervasive classified information-trafficking activities by a charity operating in the interest of a foreign government are simply not permissible under IRS and nonprofit regulations — irrespective of the motive. Previous Previous post: What’s In It for Us, Mr. Obama?